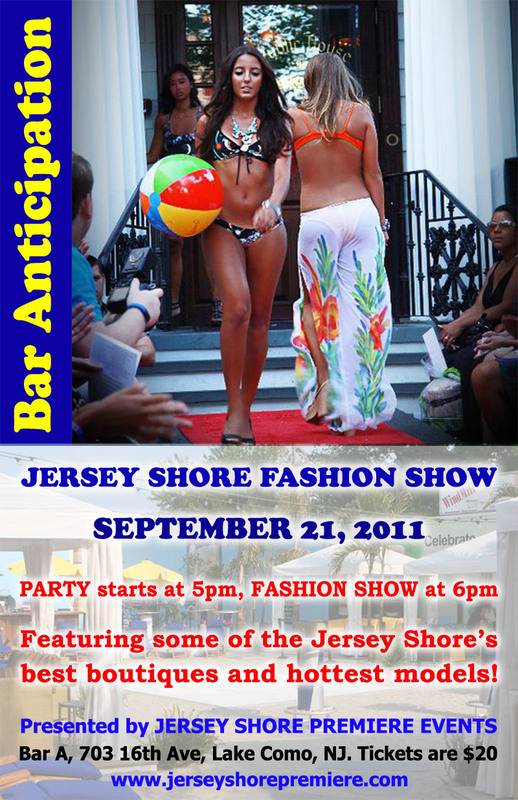 Jersey Shore Premiere Events will present the Jersey Shore Fashion Show on Wednesday, September 21st, at Bar Anticipation in Lake Como. The fashion show will support small businesses from the northern Jersey Shore by representing some of the best boutiques from the coastal Monmouth County. The event will begin at 5pm, with the fashion presentation starting at 6pm, and an after party (including live performances) to follow. Tickets are $20 which includes food to be served to our guests. The show will take place outside on Bar A’s new Grotto Beach. Part of the proceeds will benefit the Mental Health Association of Monmouth County. This Fashion Show will help boost exposure of our vital local businesses and enhance our community character. In this harsh economic climate we need to make sure that the organizations and businesses that help color our communities with unique local flavor do not fall by the wayside in the face of stiff competition from larger chain competitors that do not share our local values or give back to the community in the same way our friends and neighbors do with their small businesses. During the after party, there will be numerous opportunities to take photos on the red carpet with our models, media personalities and possibly a few celebrities. Most of the models will be local shore-area residents. Our previous events include two fashion shows in Red Bank as well as several red carpet business events. Past special guests included Kim Granatell of the Real Housewives of NJ, Mrs. New Jersey 2010, Claire Pavlinec, the Rat Rock Girl Melissa and NJ Fashion Week founder Donnella Tilery. You will love what Jersey Shore Premiere Events can do for your business or community!